Hi, I'm James Webber. 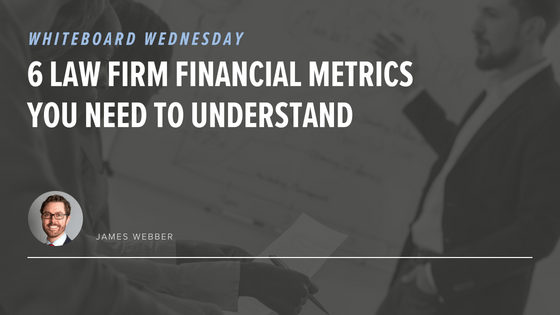 I'm the Shearman & Sterling Graduate Recruitment Partner, and we are going to talk, on today's Whiteboard Wednesday, about six law firm financial metrics, looking at how we measure financial performance in the business and how we get to profitability. So the first one, which is the one that's most relevant to associates, is utilisation. This is the metric that we use to measure an associate's activity, a lawyer's activity, measured against the total amount of time that's available for that person to work. So you normally set a number at the beginning of the year that says this is what 100% would look like, and then you measure the billable hours that person does against that metric, and the percentage of the results is called utilisation. We'll come back to an example of how that works in a second. The next key metric is realisation, and this metric is the percentage of time recorded that is actually paid. So we take the time recorded, we times it by the rack rate, - our standard billing rate - and we say that amount of dollars, pounds, or euros is what 100% realisation would look like. And so, realisation is generally less than utilisation because it takes into account things like discounts and write-offs. The realisation is the percentage of time recorded that is actually paid using the rack rates. The third metric is leverage. Leverage in a law firm refers to the ratio of associate hours to partner hours. So a high leverage means a high number of associate hours for each partner hour, and a low leverage means the reverse. Leverage is important because it translates into a higher amount of revenue for each partner hour. So for each hour a partner of the firm works, if the associates work three, then you have leveraged up the time that the partner is able to bill. Right? That's where the term comes from. All things being equal, a firm will make more money if it has higher leverage. Of course, that doesn't apply across all practice areas equally. There are some practice areas which are suited to high leverage historically, and there are others which can't take higher leverage because of the way in which the work has to be done. It's too technical, it requires a lot of partner face-time, etc. Leverage is also a component in the profitability calculation. The last, predictably, is price - essentially the number by which your hours is multiplied to arrive at your bill. The price is obviously the fee charged per hour that's been agreed with the client. Now, I would say these are sort of, if you like, traditional law firm financial performance metrics. The industry is moving increasingly away from the billable hour, I should say. And so, these metrics become more divorced over time from the financial performance of the business. But let's just keep with them for a second and work through an example of how it works. So going back to utilisation, if you have a team of associates who are 80% utilised, so 80% of the time that they have available to work on client matters is actually spent on client matters, and you have agreed with the client a 10% discount, so all of their work is discounted by 10% against the firm's established hourly rates, if all of that time was subsequently paid by the client, so it wasn't written off as excess time or agreed with the client as an additional discount, you would have a 70% realisation rate. That's sort of how the arithmetic works. But as I said, increasingly, firms are moving away from this hourly rate structure and looking more at trying to bill on a fixed cap fee basis, a certain fee for a certain amount of work independent of the hours that it takes to achieve that work. And so, it's also important to see what this translates into, and what other fee arrangements translate into, because ultimately, all fees that the firm bills constitute the firm's revenue. Right? So the firm's revenue is the total income from fees, regardless of whether they've been charged on an hourly rate or whether they're charged a fixed fee or a success fee basis, or however it might be, Right, so the firm's revenue. The firm's costs, obviously enough, are mainly the office space that we need and the salaries that we pay to our staff. You could look at the costs as effectively fixed, right, at least in the short term, in a given financial year. The profit per partner will be the revenue less the costs divided by the number of equity partners. And so, one way of measuring law firm profitability is to just look more simply at this. Let's get as much revenue in as we can, let's spread it over as low a fixed cost base as we can, and in that way, you increase profitability. So that's the six law firm financial metrics.